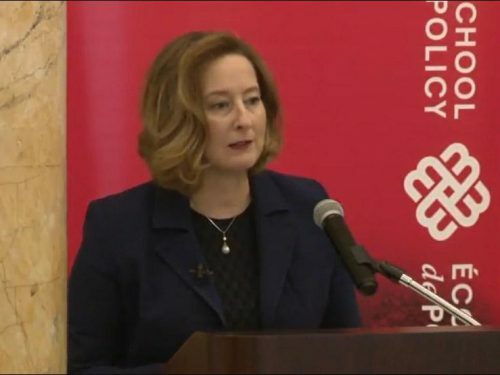 The Bank of Canada will assess a broad range of monetary policy frameworks ahead of the renewal in 2021 of the inflation-control agreement, a joint agreement between the federal government and the Bank that is renewed every five years, Senior Deputy Governor Carolyn A. Wilkins said today at McGill University’s Max Bell School of Public Policy. The review will take into account two key challenges of the post-crisis era: First, the Bank’s estimate of the nominal neutral interest rate is lower than before, so there is less conventional policy firepower to use in an economic downturn. Second, the lower neutral rate may encourage households and investors to take on excessive risk, leaving the economy exposed to boom-bust financial cycles. The Bank’s research work plan will focus on a comprehensive side-by-side assessment of alternative frameworks. In her remarks, Wilkins discussed some outstanding questions regarding several alternatives, such as a higher target for inflation, a target path for the level of aggregate prices or nominal income, and a dual mandate. The Bank’s work plan will also focus on options to strengthen the Bank’s slate of unconventional policy tools that can be used if needed. In its work, the Bank will engage with academics and other central banks as well as a wide range of private sector stakeholders and interested Canadians. Senior Deputy Governor Carolyn A. Wilkins discusses public policy issues around monetary policy frameworks and how those issues have become more complex in the post-global financial crisis world.